The Arabian Tent Company blog is a fantastic source for ideas and inspiration to really make your event stand out. Whether youâ€™re planning a wedding, a birthday or a corporate event, take a look at the Arabian Tent Company blog for advice and guidance on planning a memorable event. Founded in 2004, the Arabian Tent Company has a wealth of experience providing luxury marquees and exquisite tents for hire. 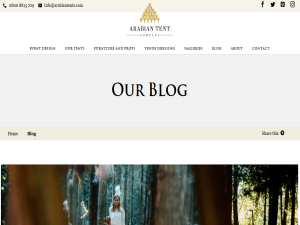 This what your Arabian Tent Company Blog Blog Ad will look like to visitors! Of course you will want to use keywords and ad targeting to get the most out of your ad campaign! So purchase an ad space today before there all gone! If you are the owner of Arabian Tent Company Blog, or someone who enjoys this blog why not upgrade it to a Featured Listing or Permanent Listing?